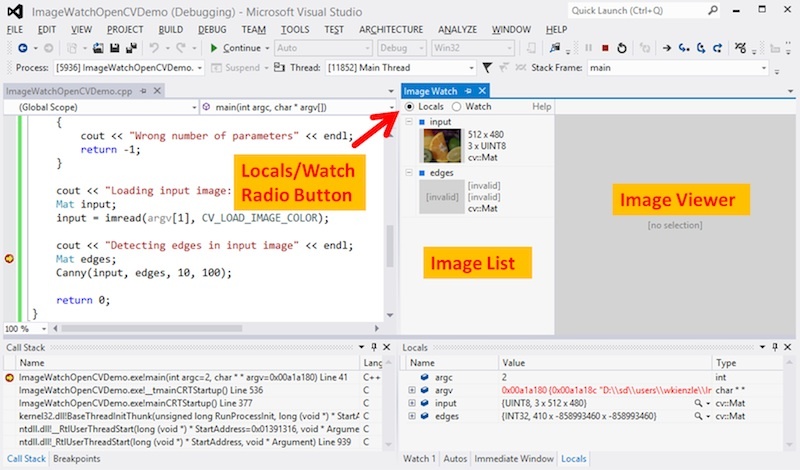 Image Watch is a plug-in for Microsoft Visual Studio that lets you to visualize in-memory images (cv::Mat or IplImage_ objects, for example) while debugging an application. This can be helpful for tracking down bugs, or for simply understanding what a given piece of code is doing. Visual Studio 2012 Professional (or better) with Update 1 installed. Update 1 can be downloaded here. An OpenCV installation on your Windows machine (Tutorial: Installation in Windows). Ability to create and build OpenCV projects in Visual Studio (Tutorial: How to build applications with OpenCV inside the Microsoft Visual Studio). Download the Image Watch installer. The installer comes in a single file with extension .vsix (Visual Studio Extension). To launch it, simply double-click on the .vsix file in Windows Explorer. When the installer has finished, make sure to restart Visual Studio to complete the installation. Image Watch works with any existing project that uses OpenCV image objects (for example, cv::Mat). In this example, we use a minimal test program that loads an image from a file and runs an edge detector. To build the program, create a console application project in Visual Studio, name it “image-watch-demo”, and insert the source code below. << "No output is displayed or written to disk." Make sure your active solution configuration (Build ‣ Configuration Manager) is set to a debug build (usually called “Debug”). This should disable compiler optimizations so that viewing variables in the debugger can work reliably. Build your solution (Build ‣ Build Solution, or press F7). Before continuing, do not forget to add the command line argument of your input image to your project (Right click on project ‣ Properties ‣ Configuration Properties ‣ Debugging and then set the field Command Arguments with the location of the image). To set the breakpoint, right-click on the source line and select Breakpoints ‣ Insert Breakpoint from the context menu. The radio button at the top left (Locals/Watch) selects what is shown in the Image List below: Locals lists all OpenCV image objects in the current scope (this list is automatically populated). 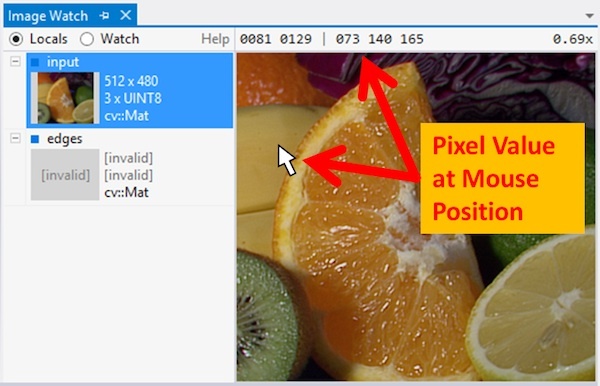 Watch shows image expressions that have been pinned for continuous inspection (not described here, see Image Watch documentation for details). 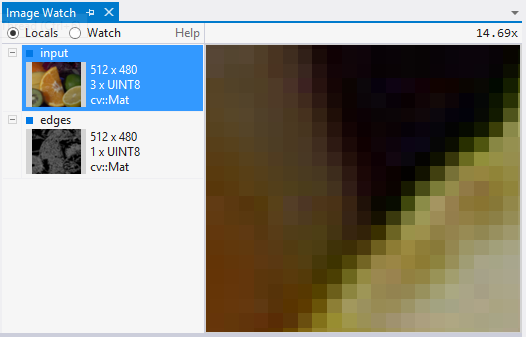 The image list shows basic information such as width, height, number of channels, and, if available, a thumbnail. In our example, the image list contains our two local image variables, input and edges. If an image has a thumbnail, left-clicking on that image will select it for detailed viewing in the Image Viewer on the right. The viewer lets you pan (drag mouse) and zoom (mouse wheel). It also displays the pixel coordinate and value at the current mouse position. Note that the second image in the list, edges, is shown as “invalid”. This indicates that some data members of this image object have corrupt or invalid values (for example, a negative image width). This is expected at this point in the program, since the C++ constructor for edges has not run yet, and so its members have undefined values (in debug mode they are usually filled with “0xCD” bytes). 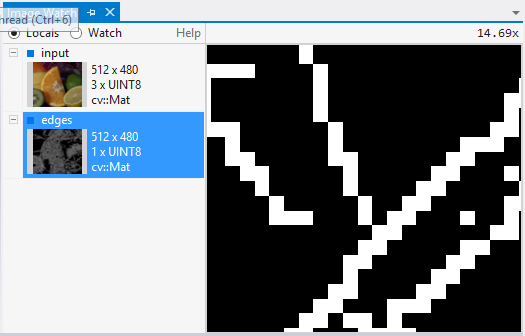 From here you can single-step through your code (Debug->Step Over, or press F10) and watch the pixels change: if you step once, over the Mat edges; statement, the edges image will change from “invalid” to “empty”, which means that it is now in a valid state (default constructed), even though it has not been initialized yet (using cv::Mat::create(), for example). If you make one more step over the cv::Canny() call, you will see a thumbnail of the edge image appear in the image list. 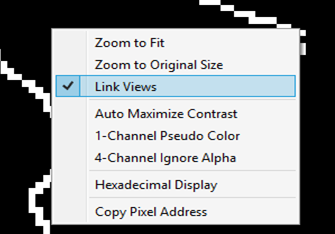 Right-click on the Image Viewer to bring up the view context menu and enable Link Views (a check box next to the menu item indicates whether the option is enabled). You may also switch back and forth between viewing input and edges with your up/down cursor keys. That way you can easily verify that the detected edges line up nicely with the data in the input image.